Gartner’s Magic Quadrant (MQ) for Application Performance Monitoring (APM) introduced five dimensions of functionality that they believed APM products must include in order to qualify for MQ consideration. 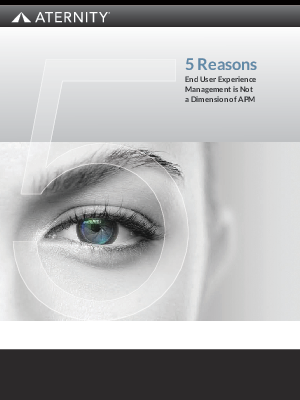 One of those five dimensions is End User Experience Management (EUEM). The popularity of APM has shined a bright light on only one component of EUEM and has obscured the fact that EUEM is a separate, multi-dimensional solution that is essential to an organization’s performance management initiatives. Enterprises must see what the End User sees, experience what the End User experiences, in order to ensure the effectiveness of IT and business services. This is what EUEM delivers and why it matters.